In the Messianic and Christian arena’s the issue of Salvation and Levitical animal Sacrifice has caused charged heated debates and cause congregational and denominational splits. How were the “Old Testament Saints” saved? Will there be animal sacrifice during then Third Temple when Messiah reigns, if so why? Wouldn’t animal sacrifice slap Yeshua and his sacrificial atoning work on the cross in the face? And many questions of the like, circle submerge and emerge continuously, as a Natsari Jew let me put this weary animal to rest. If you don’t like the answer, take it up with HaShem and His Word. If it blows down your little theological house of cards the maybe you should question the materials you have used, or the foundation it has been founded upon; GOD’s Word, or tradition and doctrines of men? Let me first tackle the issue of salvation. It is the misconception of many that the “Old Testament Saints” were saved by works, keeping the Torah (law), in combination with the Levitical animal sacrifices, and “New Testament Saints” are saved by “Grace” and Yeshua’s death on the cross. How fair is that!? Christians say there is only one way of salvation, this view would contradict that. This is purely a Christian false doctrine; nothing could be further from the truth. Then how were the Believers before the death and resurrection of Yeshua, saved!? The saints in the Tanak were saved the same way as the saints in the Renewed Covenant. The difference is perspective. Those in the Tanak looked forward to, and believed in the Messiah and His atoning work that was coming. The Renewed Covenant saints (us) look back and believe in the Messiah and His atoning work that already came, and is coming again! The sacrifices of the Tabernacle and Temple era, before Yeshua came never atoned for, or removed sin. In the Renewed Covenant book of Hebrews 10:4 “It is NOT possible that the blood of bulls and of goats should take away sins.” it just rolled it back like a credit card debt until Messiah came to pay it in full, atoning for them all past, present, and future (Isa.53:6; IPt.2:24; IJn.2:2; Heb.1:3; 5-10). Yeshua worked within the framework of Torah, and the sacrificial system set up therein. · It was to be a physical object lesson that pointed to the coming Messiah and what He would do. It acted as a credit card that covered, did not take away, and rolled back the sin debt until someone, Messiah, could come along and pay it. In the time of the Third Temple the sacrifices will be a reminder of the Messiah who came and what He did (Is. 56, 66; Zech. 14:16-21). The sacrifices before Yeshua came only pointed to the Messiah which was to come, and the sacrifices after Yeshua, and that will take place in the Millennial Reign, point back to Messiah’s atoning work. · It provided and will provide food, materials and income for the Priests and their families (Leviticus 5-10). Salvation is a gift from GOD to all who will accept Yeshua the Messiah, the Living Torah, confesses, repents, and turns away from their sins. This is Faith Righteousness. This will result in becoming spiritually alive and indwelt with the Ruach Ha Kodesh (Holy Spirit) of GOD. This in turn will cause one to desire to love, obey, and please GOD. 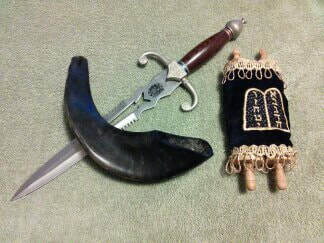 One shows this by keeping the Written Torah. This is Works Righteousness. In other words, one will walk in the footsteps of Yeshua Moshieynu (our Messiah) by walking in the Torah. Salvation comes by grace through faith alone. Salvation is not earned by Torah observance. If we love Him we WILL keep His Commandments (Torah). A person who does this will spend eternity with Him, in Heaven if one dies prior to the final resurrection, or on the New Earth in the World to Come.